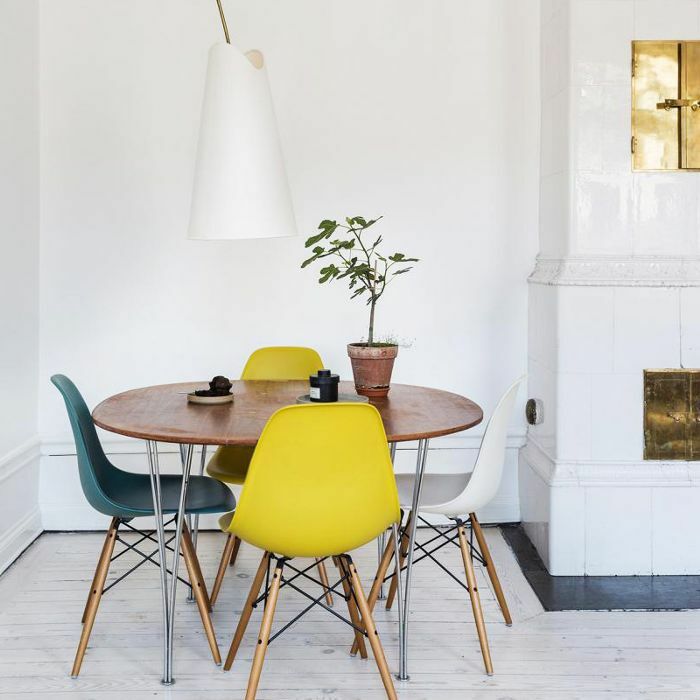 Of the many small-space conundrums you may face when decorating a tiny apartment, finding the perfect kitchen table is likely chief among them. Not only does it have to fit in tight quarters, it also has to function for your lifestyle and ideally match your aesthetic as well. Depending on how often you dine in or entertain guests at home, you may want to consider finding a small table that can easily transform into a larger one when you need it (so long as space allows). If you're not one to cook big meals at home, opt for a small bar table and stools or a simple café table for two. Thankfully, retailers like IKEA practically specialize in small spaces. 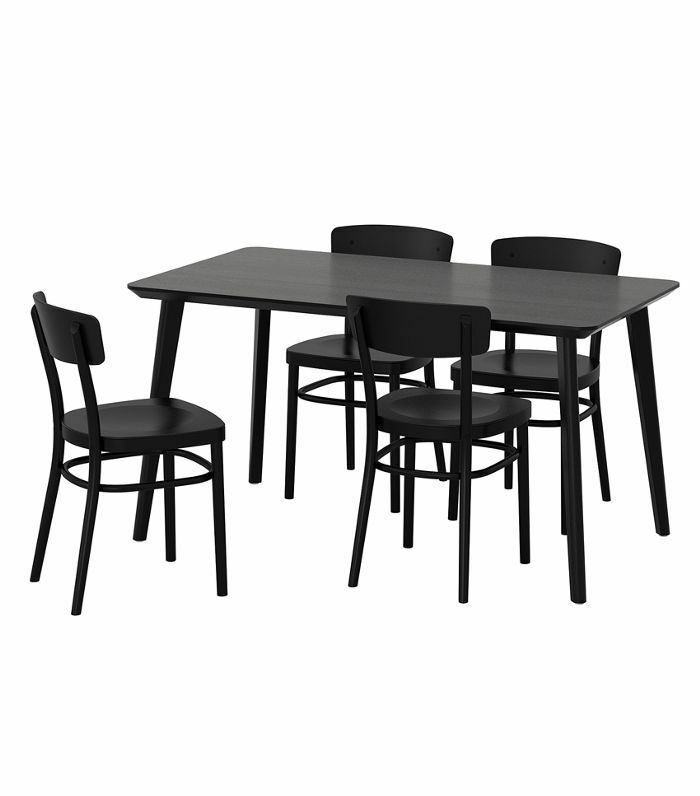 The Swedish design store offers a variety of small kitchen tables with matching chairs to boot in every color and style you could imagine. 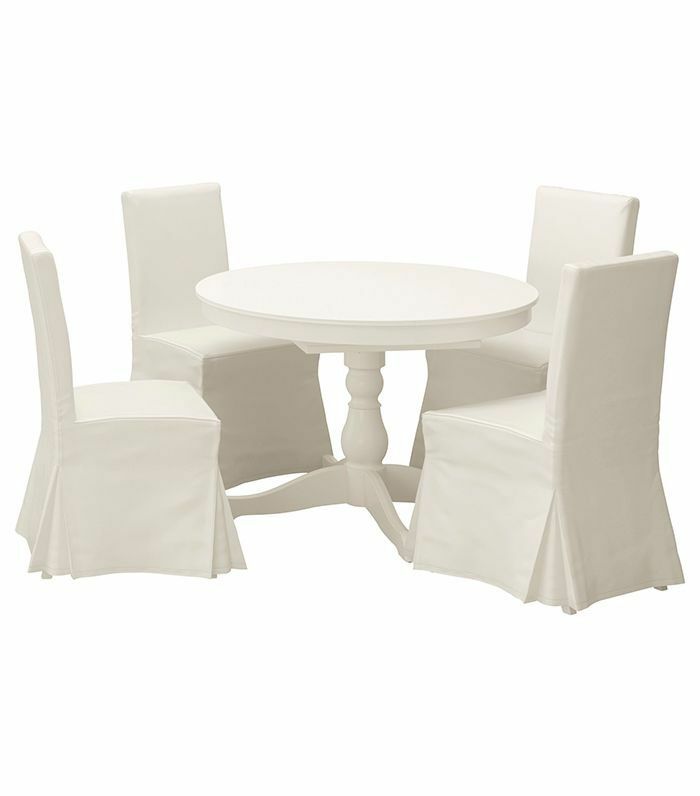 Many also come with expandable leaves that make it easy to turn a small table into a larger dining area. 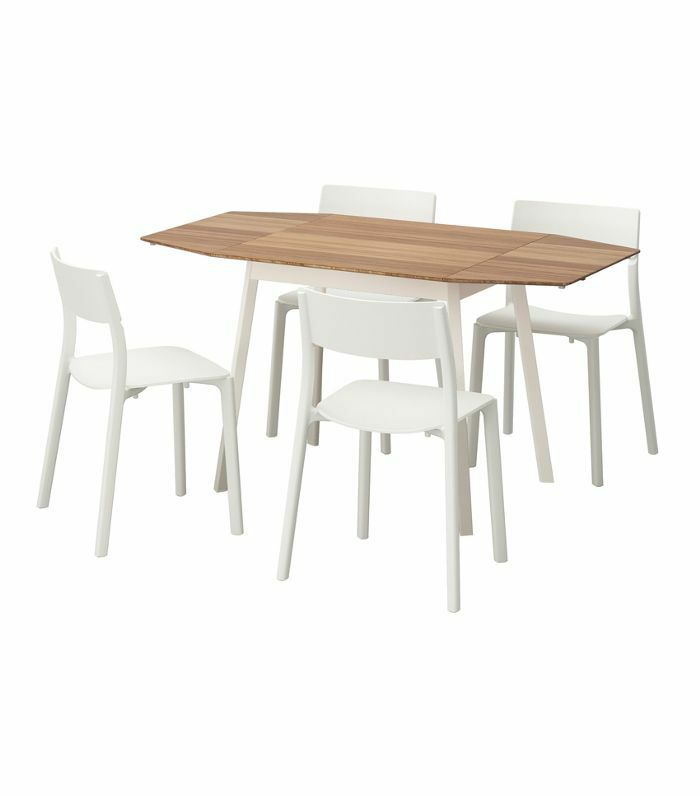 Ahead, we've rounded up some of the best small IKEA kitchen tables meant for fitting in tiny spaces. Shop the small-space furniture below and be sure to pay attention to the dimensions. 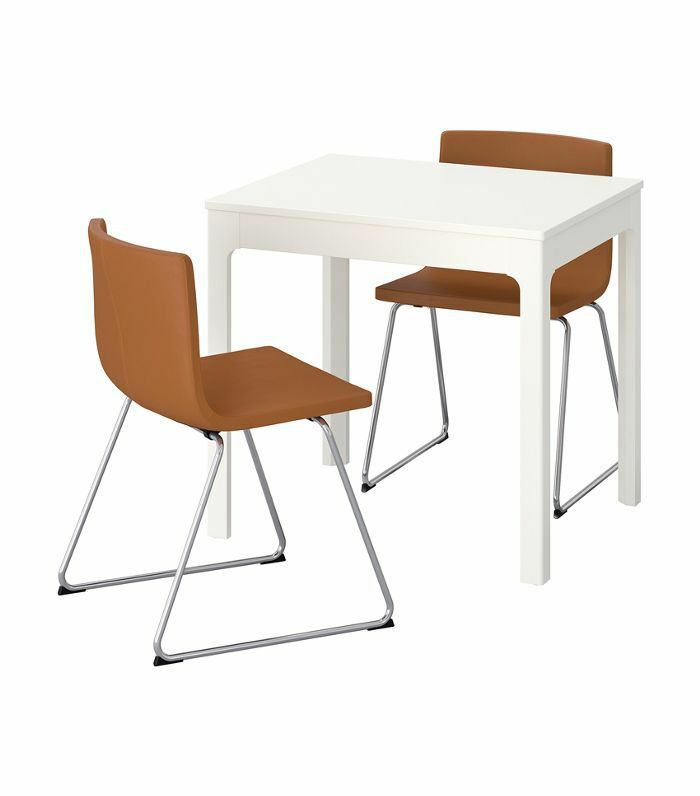 This small space–friendly kitchen table is perfect for a tiny apartment with just one or two inhabitants. However, if you plan on entertaining, you can easily extend the table with a leaf that's sneakily stored under the table top. 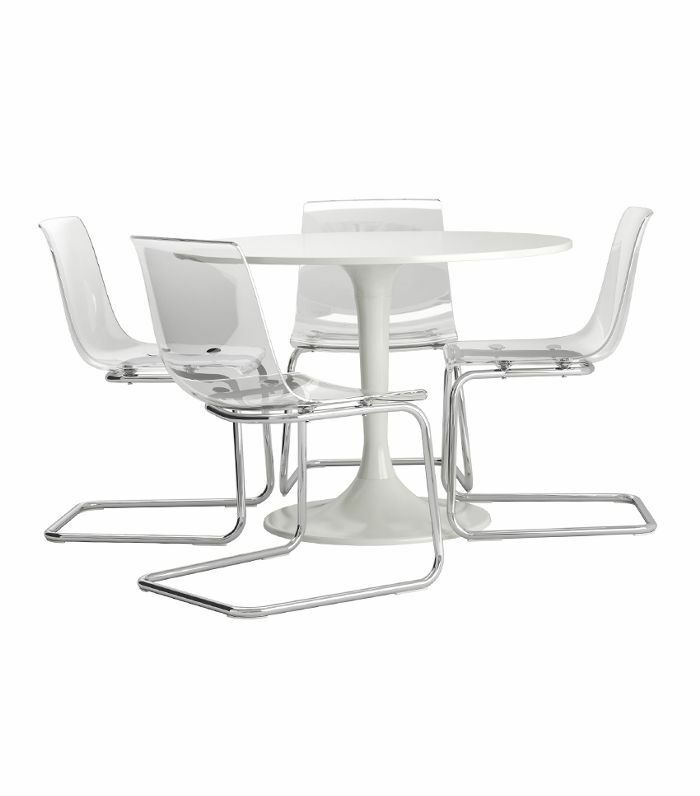 For a contemporary-cool look, go for a glass top table and white chairs. The see-through top will blend in, making the rest of your space feel larger. 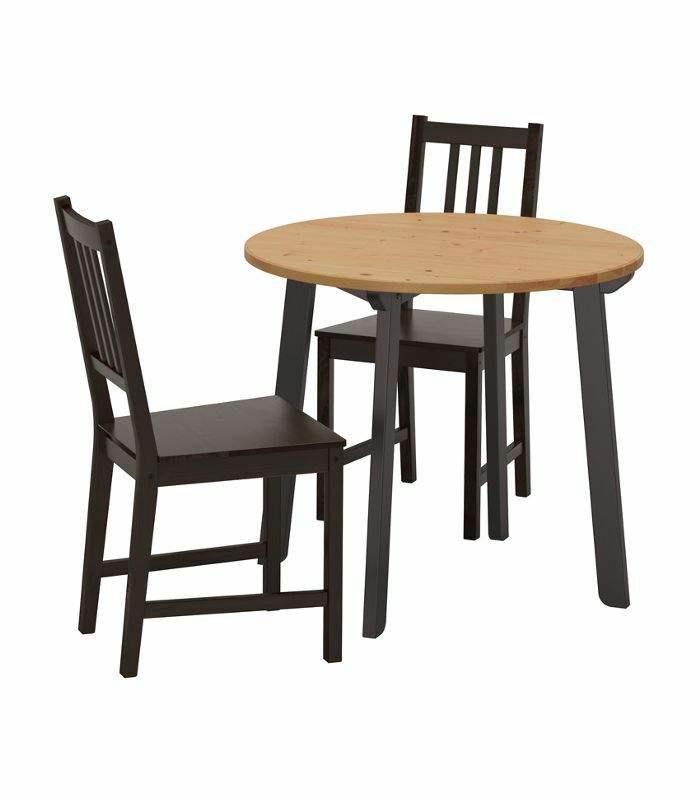 This quaint little circular table will transport you to a small café every time you sit down. All you need is a croissant and a café au lait. A closer inspection of this simple black table actually reveals variations in the wood, giving the piece a more natural feel. It would look sophisticated in any modern space. 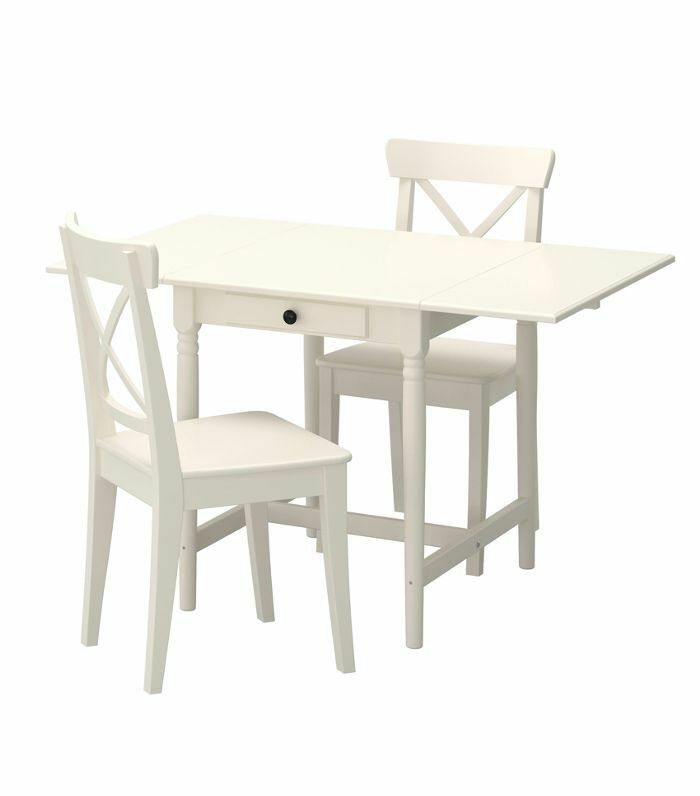 Transform your small kitchen into a welcoming cottage with this traditional white table with matching chairs. 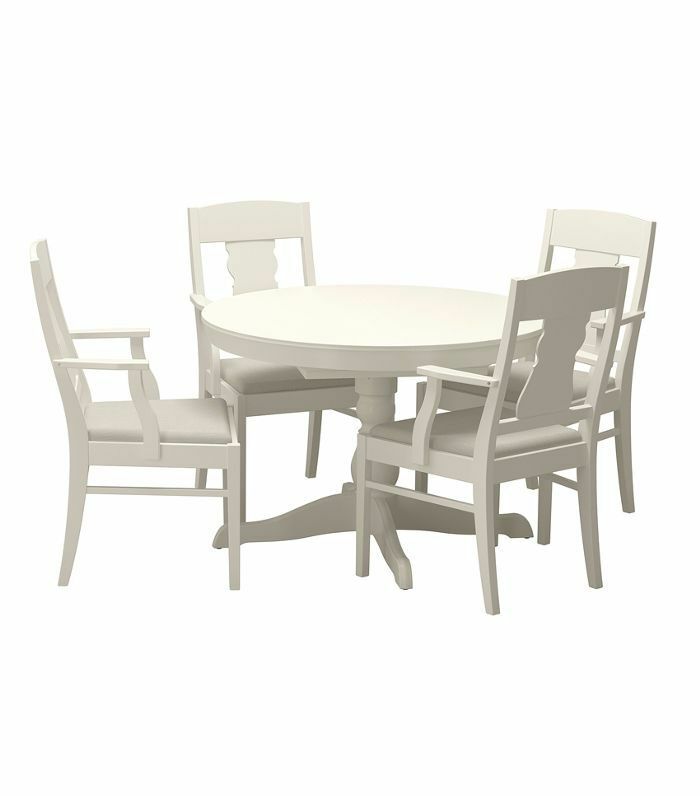 This round table has soft edges for a mod look. 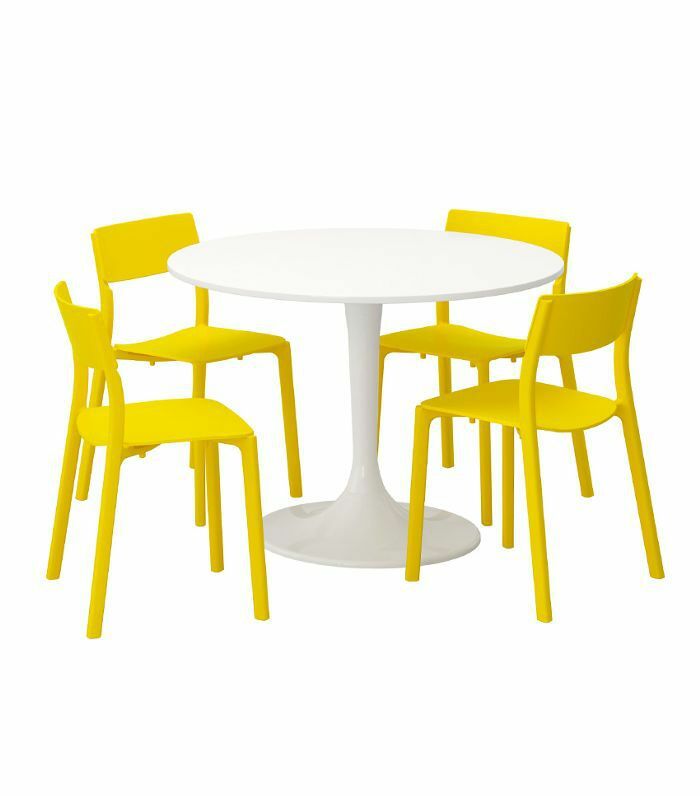 Paired with colorful chairs, it will add a whimsical touch to even the smallest of spaces. 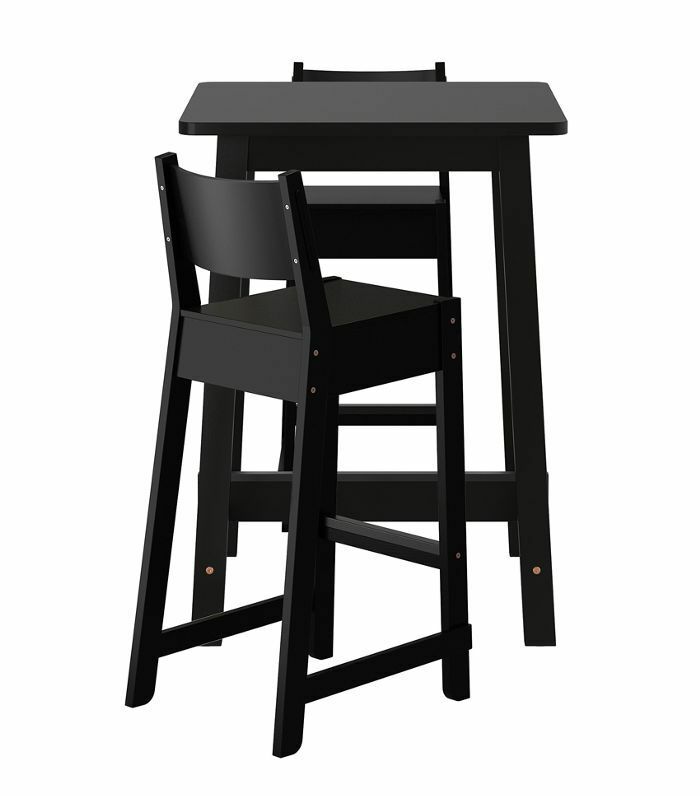 Forgo a traditional kitchen table and opt for a sleek bar table and stool. It won't take up much space, but it will make a statement. A flexible table, this piece of furniture can transform to fit your needs. Allow the drop-leaf bamboo tabletop to hang at the sides of the table or extend them out to fit guests. This farmhouse kitchen table easily transforms to fit a variety of sizes. It seats two to four people depending on how many of the two leaves you utilize. No one will guess that this chic extendable table is from IKEA. It can seat as many as eight people (if your space has the room for it). 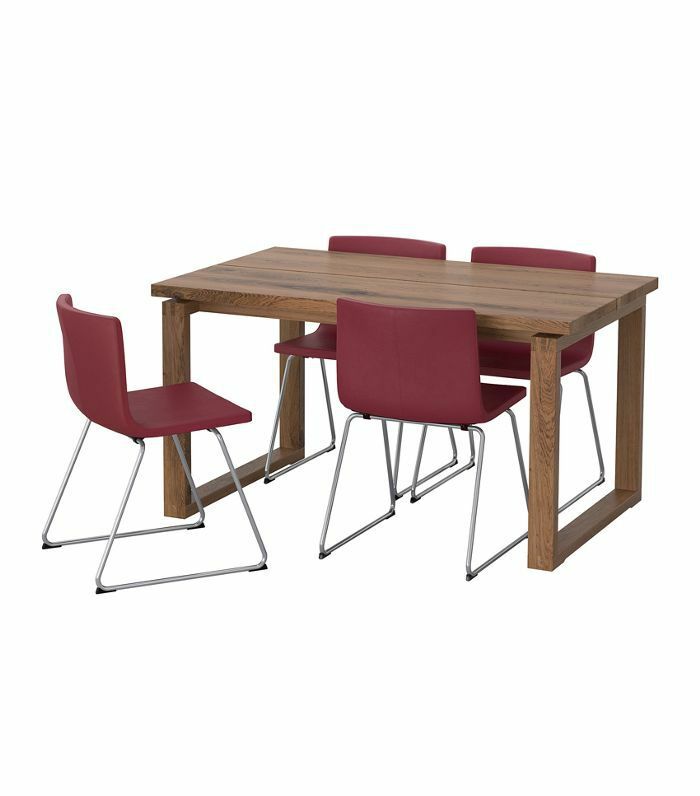 Sit comfortably around this small kitchen table. 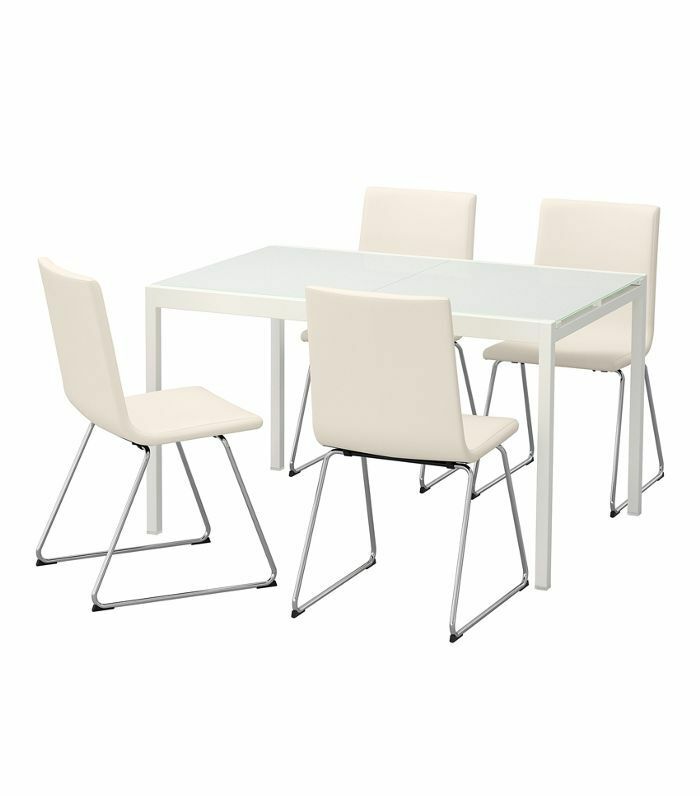 It comes with clear chairs that create the illusion of more space. 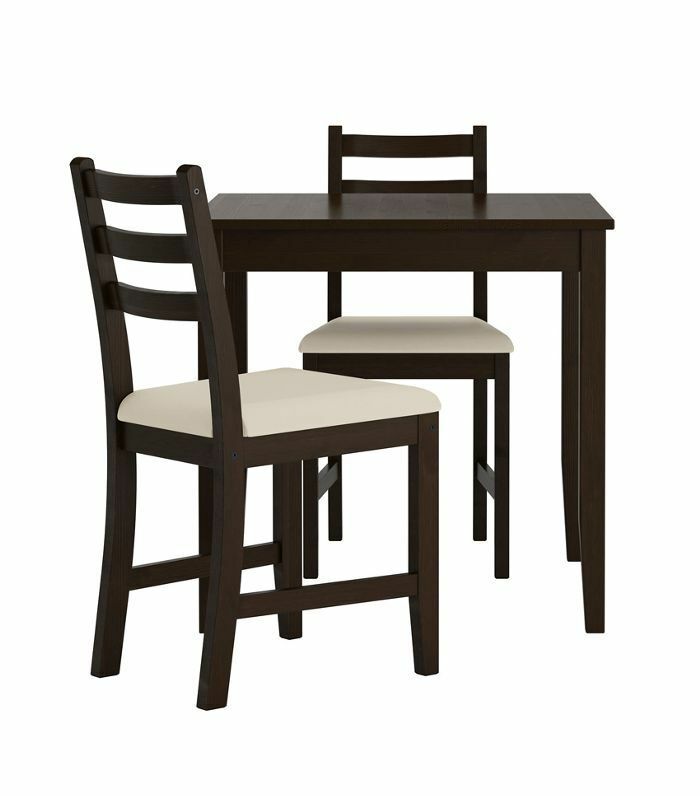 For a traditional look, go for this dark brown kitchen table set fit for two. Even a small kitchen seating area can feel like a dining room with the right furniture. 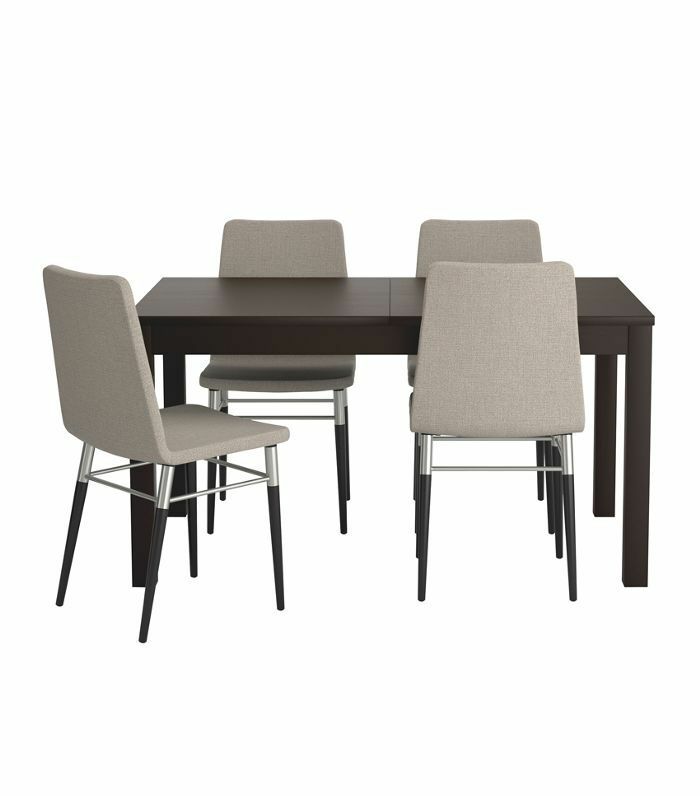 If you have room for it, this classic kitchen table and dining chairs would feel luxe in any space. This solid oak top table gives the piece of furniture character and distinction, despite its modest size. Notice the design details at the edge of the table that give it a little something extra. Sign up for MyDomaine's newsletterfor décor inspiration, career advice, recipe ideas, and more.